“Turning Golem” features music that was especially composed for the piece, and which was inspired by the music of the Ancient Sumerians – the oldest written music that has been found to date. The show will be staged on three separate occasions, the first being on the 17th August at the Dark Bombastic Evening in Transylvania, Romania, and the second at the Garage in Bergen, Norway on the 25 th October, while the third will take place at the Phantoms of Pilsen Festival in the Czech Republic on the 26th October. 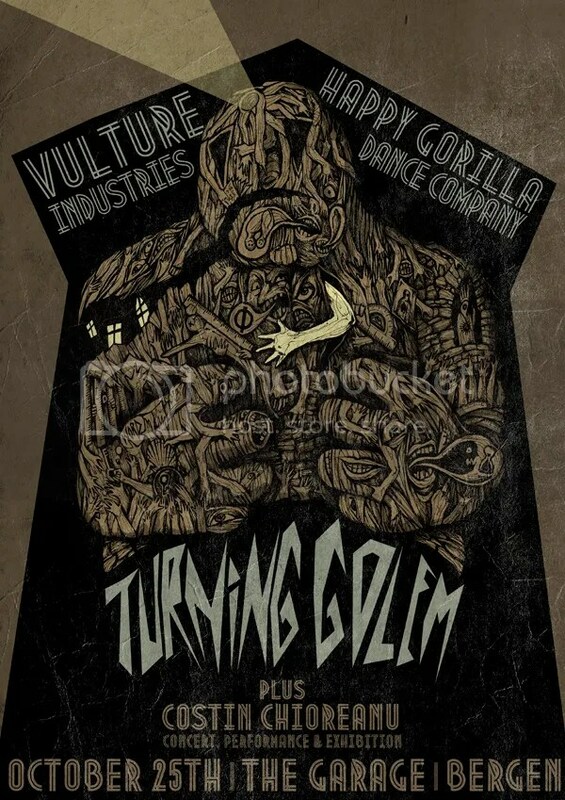 The theme of “Turning Golem” is based around the premise that “truth” is relative and that we all have an inherent need to define ourselves and our world by means of a manufactured infallible system of truths. It’s about our need to believe in order to justify our own existence; about our need for meaning, and the anguish of the void. A short movie about “Turning Golem” is also in the works. 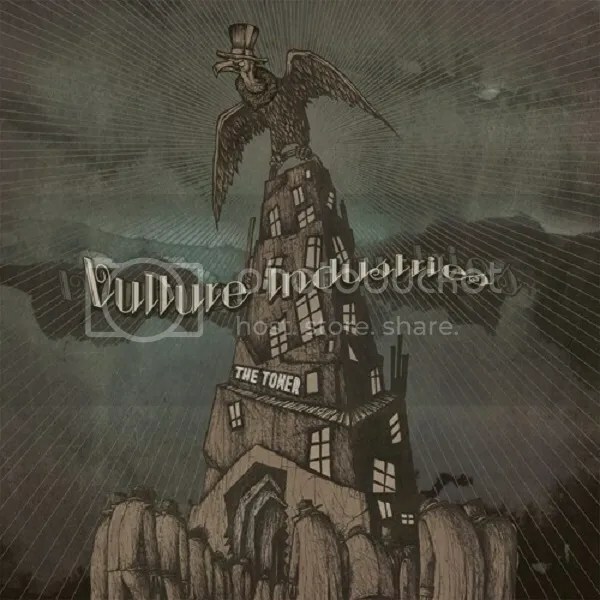 With a their new full-length album “The Tower” due out on Season of Mist on the 27th September in Europe and the 01 October in North America, VULTURE INDUSTRIES will include the first live debut of five tracks from the album during the “Turning Golem” show in Romania. 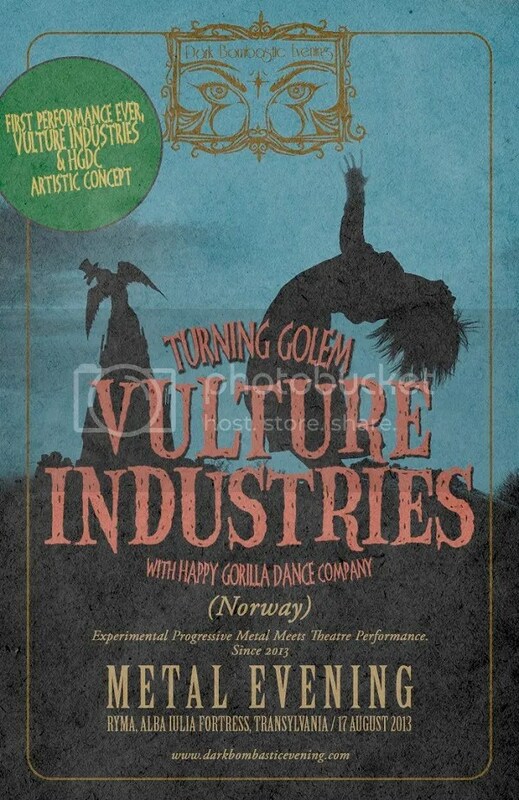 The show in Bergen, which is coincidentally the home town of both VULTURE INDUSTRIES and the HAPPY GORILLA COMPANY is a collaboration with BIT-Teatergarasjen, and forms part of their METEOR Theatre Festival, which will also feature an exhibition by Romanian designer Costin Chorineu and his creations based on “Turning Golem”. The show will also serve as the release party for “The Tower”.